Salty-crunchy snacks are my vice. But since chips are silly expensive (IMHO), I keep popcorn on hand at all times. 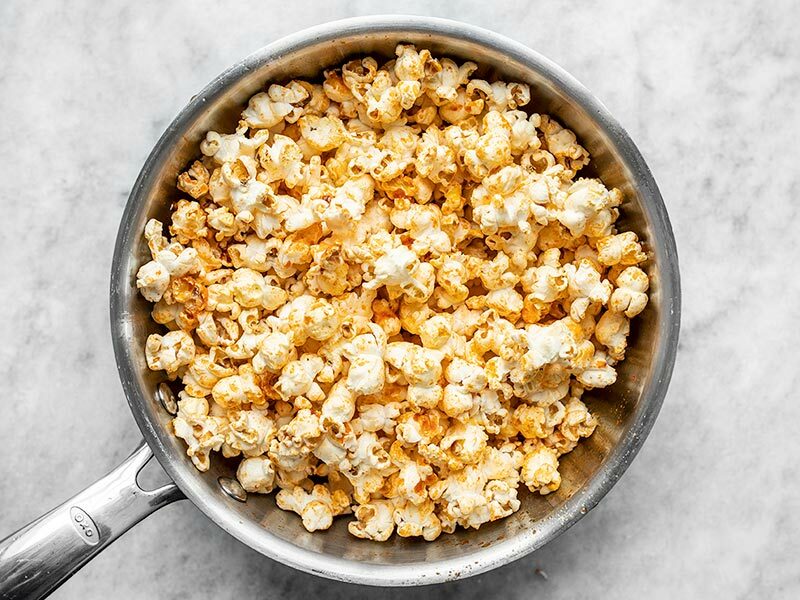 Popcorn only takes about 5 minutes to make and the flavor possibilities are endless. 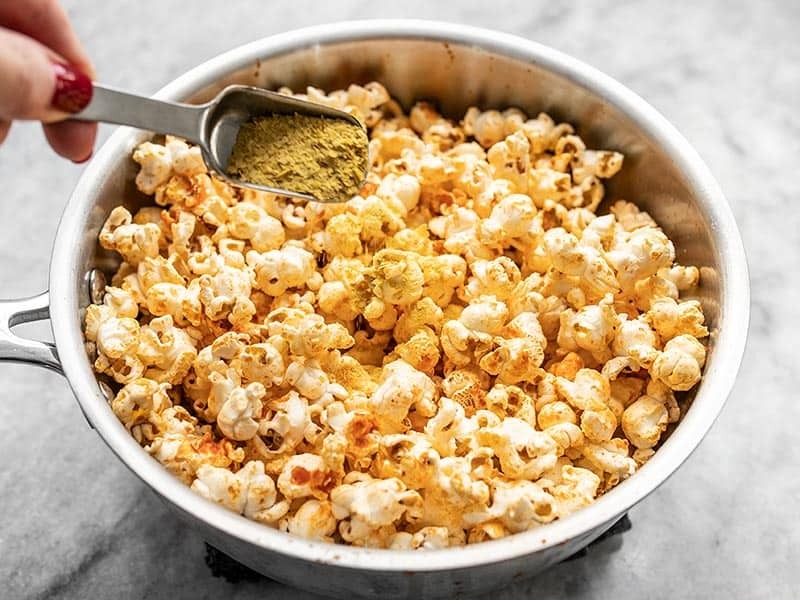 Nooch popcorn (popcorn with nutritional yeast) is pretty popular these days, but I like to go one step further and toss my popcorn in sriracha butter before adding the “nooch” so it sticks a little better and I get that extra spicy kick. 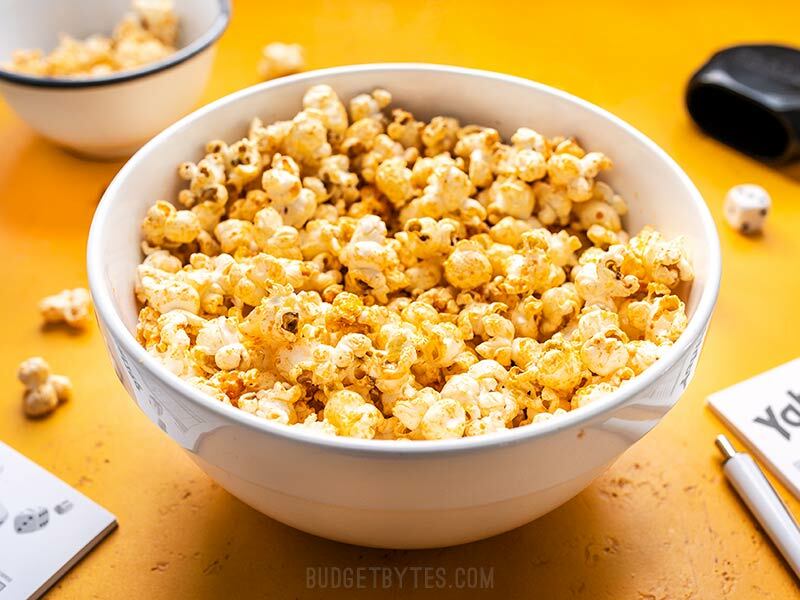 This Sriracha Nooch Popcorn hits all my flavor spots with salt, crunchy, spicy, and umami. It’s pretty much everything I’ve ever wanted in a snack. P.S. I was told not to eat popcorn while I have my braces and my answer to that was a big fat, “Pfffft!” Sriracha Nooch Popcorn is totally worth the risk, IMHO. Nutritional yeast is a deactivated form of Saccharomyces cerevisiae, the same strain of yeast used in baking and brewing. It is sold in powdered or flaked form, which kind of resembles fish food in texture. It’s often used in cooking for its slightly cheesy flavor, which makes it a great vegan alternative to Parmesan, and for its high nutrient content. Nutritional yeast is high in protein, fiber, B vitamins, and minerals, so sprinkling it over your food is an easy way to get an instant nutritional boost. Where Do I Find Nutritional Yeast? Luckily, nutritional yeast is becoming pretty popular, so you can find it at most major grocery stores, and if not check your local health food store. Nutritional yeast is usually sold near specialty diet foods (like gluten-free or organic products), or near dietary supplements. Trader Joe’s sells very budget-friendly nutritional yeast, and Bob’s Redmill or Braggs are two brands that I often see in major grocery store chains. Stove Top or Air Popped Popcorn? 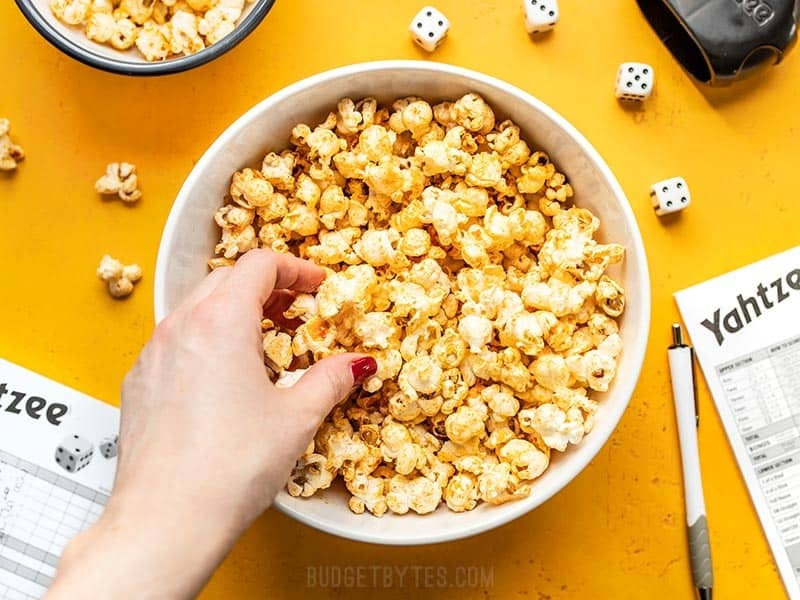 Sriracha Nooch Popcorn is the perfect salty snack with tons of crunch, a spicy buttery coating, and a slightly cheesy flavor thanks to nutritional yeast. Add the cooking oil to a medium sauce pot along with one popcorn kernel. Place a lid on the pot and then place the pot over medium-high heat. Allow the oil to heat until the kernel pops. Once the single kernel pops, lift the lid on the pot, add the rest of the popcorn kernels, and replace the lid. 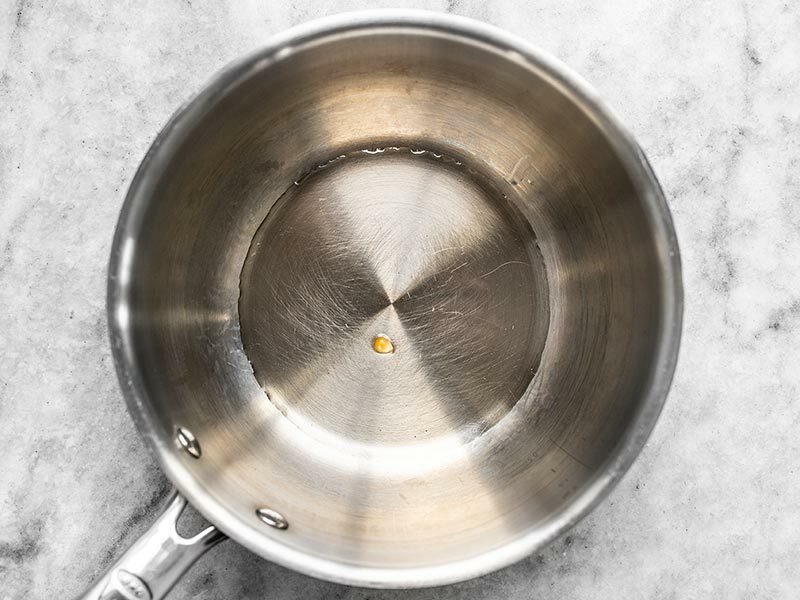 Give the pot a vigorous shake back and forth to make sure all the kernels are coated in the hot oil. Let the pot continue to heat over medium-high, shaking the pot occasionally, until all the kernels are popped (or until you hear the popping slow to one kernel every 3 seconds or so). Remove the pot from the heat and immediately pour the popped corn into a large bowl. Let the pot sit for a couple of minutes to cool slightly so the butter doesn't burn. Once slightly cooled, add the butter and sriracha to the pot. 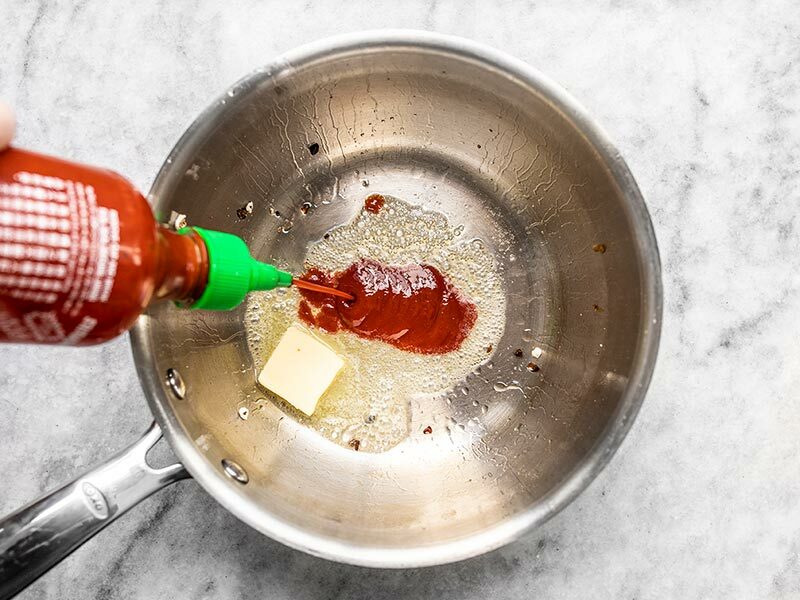 Allow the butter to melt then swirl it with the sriracha to combine. 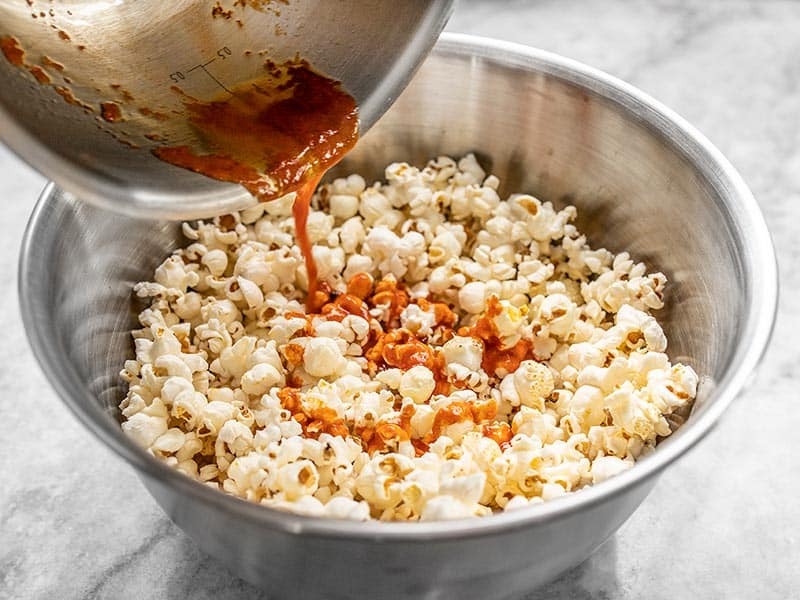 Drizzle the sriracha butter over the popcorn in the bowl, then pour the popcorn back into the pot. Place the lid on top and give the popcorn a really good shake until all the kernels are evenly coated in sriracha butter. Return the coated popcorn to the bowl, sprinkle the nutritional yeast over top, then serve. Add salt if desired (I did not). *Use a high heat cooking oil, like corn, grapeseed, canola, safflower, sunflower, or soybean. Use the right kind of oil. A high smoke point oil is critical, as you need to heat the oil and popcorn extremely high to make it pop. Using a low heat or low “smoke point” oil will result in burning or even the oil bursting into flames. Use enough oil. 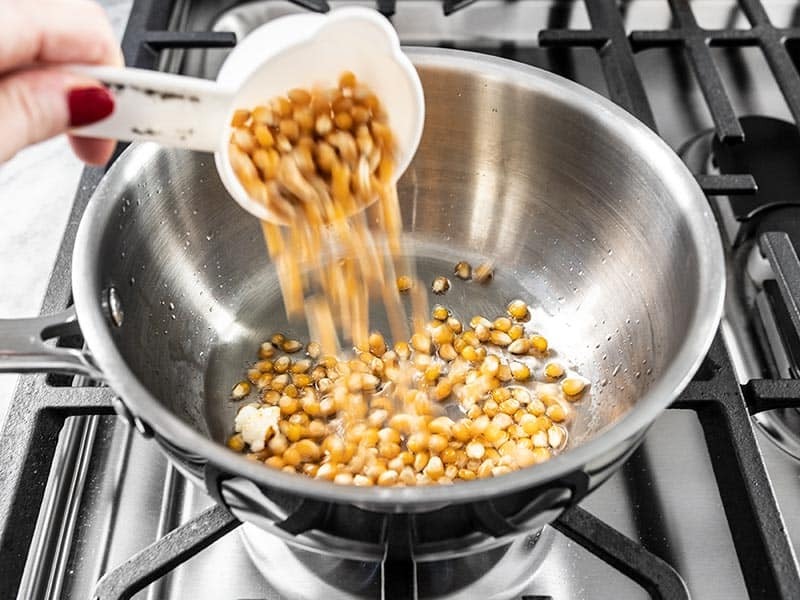 If you don’t use enough oil in the pot the kernels will not be properly surrounded by heat and will burn instead of popping, or only slightly pop, leaving you with small dense pieces. Start with just one kernel. I know it’s tempting to add all the kernels to the pot in the beginning, but you’ll get bigger, fluffier pieces if you wait until that oil is screaming hot before you add the rest of the kernels. The first kernel acts as an indicator for when the oil is hot enough to give the sudden burst of heat needed to make big fluffy pieces. Remove the popcorn from the pot right after popping. If you leave it in the hot pot, it can begin to burn on the bottom and condensation from under the lid can drip onto the top making the top layer soggy. Start by adding 2 Tbsp high heat cooking oil to a medium sauce pot, along with one popcorn kernel. This one kernel is your temperature indicator. When it pops you know the oil is hot enough to add the rest of the kernels. Having the oil super hot before you add the popcorn creates bigger, fluffier pieces of popcorn. Place a lid on the pot, then place it over medium high heat. Wait for the single kernel to pop, then once it does add the rest of the kernels. Put the lid back on top and give the pot a good shake back and forth to make sure the kernels are all coated in that super hot oil. The kernels will begin to pop within about a minute or so. Let them continue to pop, giving the pot the occasional shake, until the popping slows to one pop every three seconds or so (the lid should remain in place the whole time). 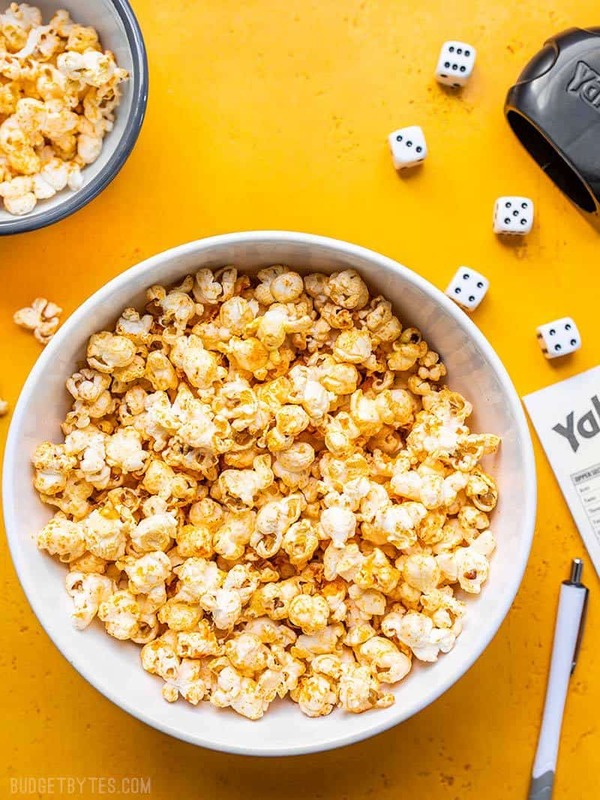 Remove the pot from the heat and immediately pour the popcorn into a large bowl Let the pot sit for a minute or two to cool off a bit. Once the pot is slightly cooled (it will still be plenty hot to melt the butter), add 1 Tbsp butter and 1 Tbsp sriracha. Swirl to combine the two. Return the popcorn to the pot, put the lid back on top, and give it a really good shake to coat all the popcorn in the sriracha butter. There needs to be an inch or two of room in the pot for the popcorn to move around for this to work properly. So if there is too much, just leave a little in the bowl. It will be okay. Lastly, sprinkle 1/2 Tbsp nutritional yeast over the popcorn (you can do this in the pot or once the popcorn is back in the bowl). 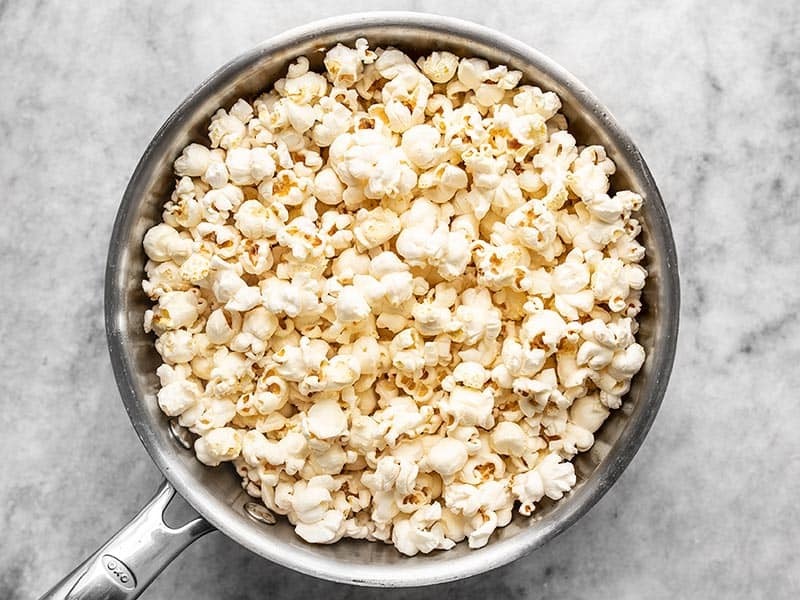 Sounds good… will try ; ) I heard that movie popcorn is popped in coconut oil… so I’ve been doing that and it is really an improvement! Although I use a Whirley Popper with butter and coconut oil only… so how can it be bad? And I discovered that if the ‘crispness’ fade, just put what’s left in an oven (regular or toaster) at low heat (250 ?) for few mins (5? 10?) and it’s good to go, again. Try adding garlic powder too. Yum! Thanks for the detailed instructions on stove top popcorn–it’s a fraction of the cost of microwave stuff, tastes way better, and the add on flavor options are infinite. I do buy microwave stuff for my grandsons to use after several episodes of trying to scrub out burned popcorn in my saucepans. You do have to watch carefully, but it’s only 3 minutes or so. I guess I should have kept the air popper for them instead of sending it to GoodWill years ago. Have you ever popped sorghum pearls? Supposedly it pops like popcorn but I have only burnt it. I only have sorghum on hand so I am going to use these tips and try to pop some… Sriricha butter… Omg. My husband is always making fun of me because since I tried sriricha, I have had it on nearly every meal… This sounds so good. Ps: i buy all my nutritional yeast and other bulk things on vitacost.com… They are awesome and always have great sales!!! Bob’s Red Mill website has directions to microwave pop sorghum. I’ve not heard of this, but ate both cooked sorghum grains and sorghum syrup during my childhood in Iowa. I’m going to order some and try it myself. I was delighted to see this post; this has been my favorite snack for years! I just had it tonight in fact! One difference is that I really douse my popcorn in nutritional yeast (more like 1/4 cup per batch). I know folks will adjust as needed. Also, I buy nutritional yeast in the bulk section, which is a cheaper option around here. So glad you are spreading the good word about sriracha nooch popcorn! “Nooch”? I’ve been putting nutritional yeast on my popcorn since the 70’s, and this is the first time I’ve heard this phrase. Currently (I go through phases with my seasonings) I add a little bacon fat to the popping oil (it’s a game changer), then season with Spike, nutritional yeast, and some cayenne or chili powder. here in (Europe?) Germany we eat popcorn sweet with sugar instead of salted like it’s common in the US. I’ve tried salted or added herbs / spices, but it’s just really weird for me. I guess it’s wired in my brain to be sweet so it just doesn’t work for me unfortunately. would / could be healthy without the sugar..
it’s like when I eat chocolate I’m prepared to taste sweet chocolate and not savory pretzels or paprika or sth like that.. Here in Finland salty popcorn has been the norm at least as long as I can remember, though in recent years I’ve also seen more sweet popcorn recipes. And I think now they have sweet varieties at some movie theaters as well. But yeah, my German friend told me sweet popcorn is really common there. In the Netherlands there’s an even mix of sweet popcorn and salty popcorn. Neither is favored. In Ireland, salty popcorn is the norm and sweet is less common. So I think there’s no trend for Europe as a whole. I’m sure you could “rewire” your brain to enjoy salty popcorn too, but sweet popcorn is so good, so maybe the effort isn’t worth it.